Pop quiz: Is a salad still a salad if it doesn’t have greens in it? 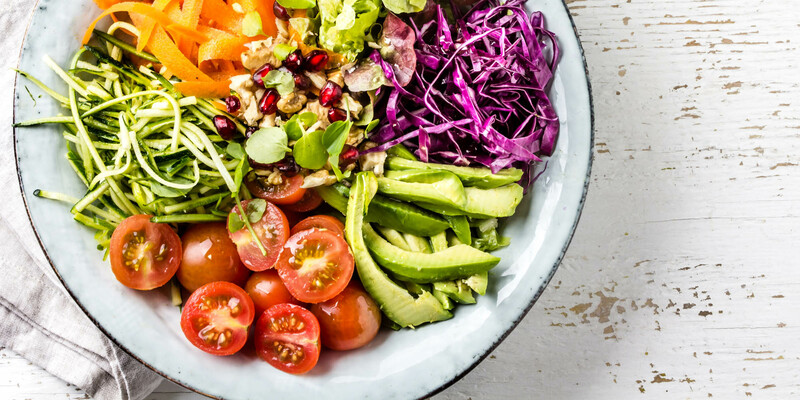 “People think you need lettuce to call something a salad,” says Chelsey Amer, a registered dietitian based in New York City. Your bowl or plate can contain any variety of ingredients — with or without dark, leafy greens — and it’s still a salad. If you’re struggling to learn to like vegetables or if greens gross you out, don’t write off salads — they’re an easy way to bump up your vegetable and fruit intake each day, even without the green leafy stuff. Here’s our foolproof formula for building a healthy, no-greens salad, along with some tips that may help you learn to like greens — some day! Easy peasy: Just skip Step 1 in our Foolproof Formula for a Healthy, Delicious Salad or the vegetarian version. (For creative, delicious green alternatives, see our list below). The non-starchy vegetables that are usually considered add-ins or toppings can replace lettuce or greens as the base of your salad. Though she likes greens, Amer sometimes bypasses them herself. “One of my favorite salads is an Israeli salad that’s made from chopped cucumbers and tomatoes, plus sometimes onion,” she says. This becomes the base of her salad in place of greens. Once you have your base, start adding your protein, carbs, and healthy fats, says Alyssa Cohen, R.D. “When you build a salad, make sure to include all three macronutrients,” she says. This ensures your salad provides enough calories and other nutrients to keep you satisfied until your next meal or snack. The other rules of building a healthy salad — and the most common mistakes we share in those formulas — still apply. You’ll want to keep portion sizes in mind, especially with healthy fats, condiments, and tasty toppings like nuts and seeds. There are so many alternatives to lettuce in a salad — almost anything in the produce aisle can be the base of your no-greens salad bowl. Cauliflower rice (and now broccoli rice) is available pre-riced at most supermarkets, or you can make it yourself in a flash by pulsing fresh florets in a food processor. Cauliflower rice tabbouleh is a fresh spin on a Mediterranean classic, and broccoli rice can be tasty with leftover Ginger Soy Flank Steak as your protein choice. If you prefer cauliflower whole, you can make Buffalo Cauliflower Bites and use them as a salad topper. Broccoli slaw is a genius way to use up the stalks that many people toss in the garbage. Buy it pre-shredded or use a vegetable peeler to remove the tough outer layer, then shred the inner stems using a food processor or spiralizer. Broccoli slaw can be tough and dry, so toss it with a pre-measured amount of dressing, massage well, and refrigerate for up to a day. Try it with Creamy Dill Dressing. How you prepare vegetables can affect the way you feel about them, as the texture can influence your sensory experience. Salads involve a lot of chewing, so starting with smaller pieces may make certain vegetables more appealing. Using a box grater, slicing attachment on a food processor, or spiralizer, you can turn unlikely vegetables into the stars of your salad. Shredded carrots and beets sweeten up salads (and are more fun to eat than giant raw chunks), while thinly sliced or shredded Brussels sprouts and cabbage disperse their strong flavor throughout your bowl. You can also grate or slice bitter radishes. Spiralized veggies make salads more fun — who doesn’t love twirling noodles? 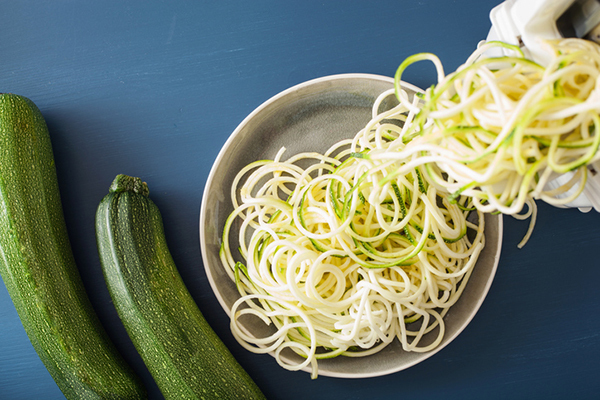 “Zoodles” made from zucchini are an obvious choice, but cucumbers, carrots, and even beets can be used in addition to or in place of noodles like soba. Massaging these tough, dry veggies with a tiny bit of salt and acid (like vinegar or citrus juice) can tenderize them. Even if you’re adding dressing, don’t skip this step. Sprinkle with a small amount of salt and acid, then use your hands to squeeze and massage until they soften slightly, give off some liquid, and appear shiny. For best results, refrigerate for at least a few hours before eating. Turn common veggie toppings — like tomatoes, celery, cucumbers, carrots, onions, or peppers — into your base by finely dicing them. Keep all pieces uniform for a fun, confetti-like salad, and opt for a mostly clear dressing (like Lemon Tarragon Vinaigrette) to show off the rainbow colors of your veggies. Remember how you can chill down anything, put it in a bowl, and call it a salad? That means grain bowls are technically salads. 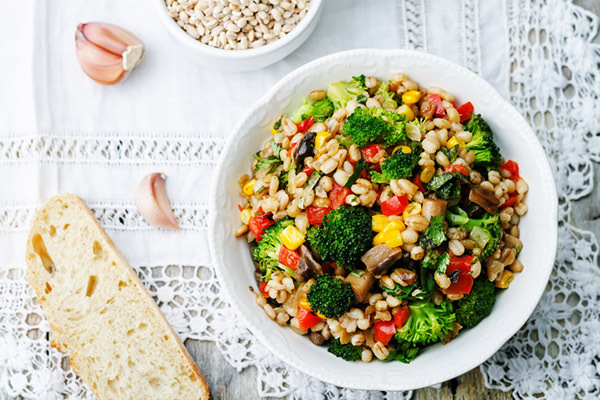 “You can also replace the greens with a starchy base such as farro, quinoa, or brown rice,” says Cohen. Build your own Buddha Bowl, try a Grilled Peach Panzanella salad, or enjoy leftover Roasted Fennel and Farro Salad chilled. Research proves trying new foods is hard. When introducing kids (and adults!) to a new food, for example, it can take between eight and 15 tries, so cut yourself some slack — and don’t give up! If you’re working to overcome a distaste for greens, here are five things you can do to a salad if you hate greens or lettuce. This tip puts a food you know and like between you and your salad. 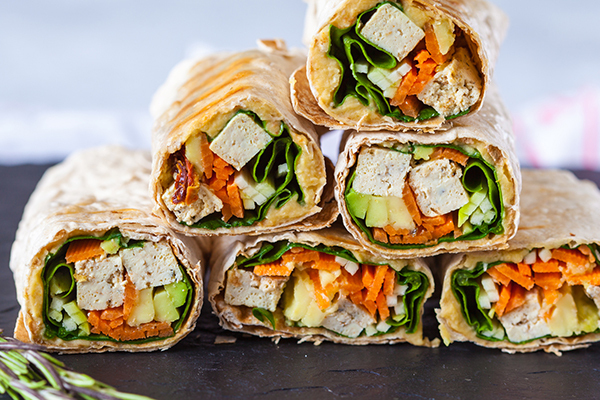 Place a serving of salad inside rice paper wrappers (like spring rolls), nori (like sushi), or a whole-grain tortilla. If you’re feeling brave, wrap your salad in a collard leaf or lettuce cups! Sometimes eating a salad can feel like a workout, and facing down huge lettuce leaves may feel intimidating. (We’re looking at you, kale). One solution? Chop your greens and other ingredients finely so they’re generally all bite-sized. 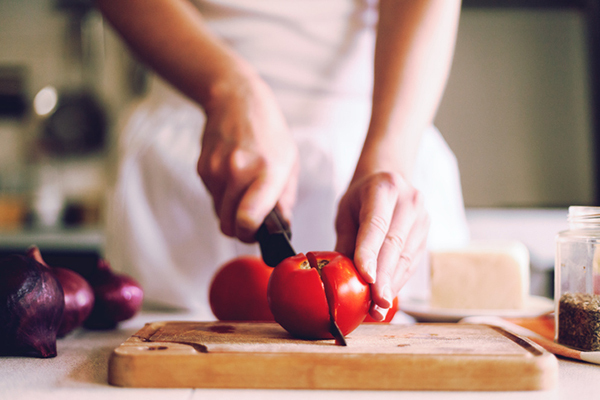 Avoid any mess by chopping your ingredients before adding any dressing. No more lettuce leaves flopping off your fork or dangling out of your mouth! Once you’ve chopped your greens, use a serving of baked chips or healthy versions of crackers to give your salad some crunch — and make it more fun to eat! Dry greens appeal to very few people, so try tossing them with dressing before making the rest of your salad. Place a portion of dressing in the bottom of your bowl, add your greens, and use tongs to toss and coat every leaf. Then add the rest of your ingredients. Start small. There’s no rule that says you must fill your entire bowl with greens. Choose your favorite vegetables and mix them in. No one likes soggy, watery greens. Be sure to dry them well, using a salad spinner or using paper towels or a dish (clean!) towel to absorb as much moisture as possible. You can chop the greens to further hide them, or use any of these other tricks. Chances are, once they’re in the bowl, you won’t notice them. A salad sans lettuce or any greens can still be a filling, nutrient-dense meal. Get creative with your ingredients and your preparation techniques, and you can eat the rainbow without ever including greens that you don’t like.